I have always loved the deep greens, yellows, and sienna's of some of the deep pools as the Merced flows through Yosemite Valley. 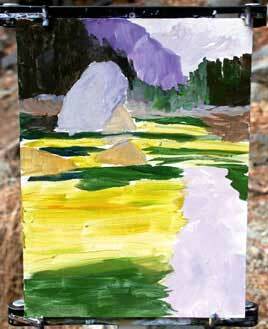 The colors stand in sharp contrast to the grayish walls of Yosemite Valley. This plein air demo tries to capture that feeling. You can read more about my painting experiences that day on my weblog. It was a winter day and not much light. 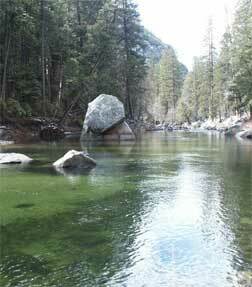 I did however locate a nice pool at the west end of Yosemite Valley. This is a snapshot of the scene. In the low 30's, it was barely warm enough to do an acrylic painting. 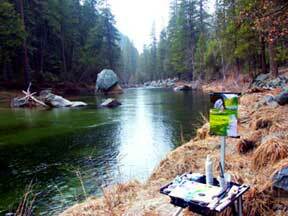 Since acrylics are water soluble, it is difficult to paint in below freezing weather! After locating the scene I wish to paint, I pencil in a quick sketch of the scene. 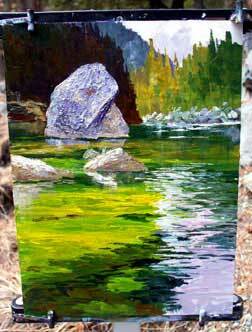 I want to capture the colors and reflections of the river, so set the horizon line high with the large rock towards the top of the painting. This is a shot of my palette. 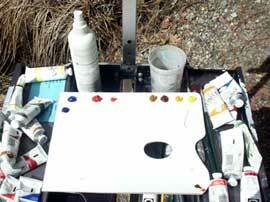 When I paint outdoors in acrylic, I use a paper palette. I don't mess with any type of 'stay-wet' palettes or boxes as I usually paint fast and use a spray bottle to keep the acrylics from drying. My palette here consists of Thalo Blue, Ultramarine Blue, Quinacridone Red, Cadmium Red Medium, Raw Sienna, Burnt Sienna, Dialiryde Yellow, and Cadmium Yellow Medium. I use other colors, but for today, that is my choice. Before I get too much into the painting, I usually mix a combination of Ultramarine Blue and Quinacridone Red to form a purple. I also sometimes mix Thalo Blue and Cadmium Red Medium to get a rich gray. I next block in quickly the general colors. I do this primarily to get rid of the white so as to judge values better as I go along. Many times I prepare my canvas with a coating of Yellow Ochre or Burnt Sienna to tone the white. However, today, I am starting with just a white canvas. For the background, I am using the mixed purple. The other areas are from the mixed gray. The water is Cad Yellow Med and Thalo Blue. I usually try to let this stage dry before going on. 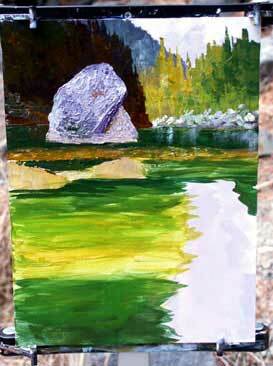 Outdoors with acrylics, this generally takes only a few minutes. I then start working from the background forward. I usually work from the back to the front so as to be able to overlap foreground objects more crisply and readily against the background. Here I have blocked in more of the distant mountain and the sky. I am using the same basic colors as the previous block-in. I keep working forward, blocking in the tree line on the left, working the distant stream bank, then the stream itself. 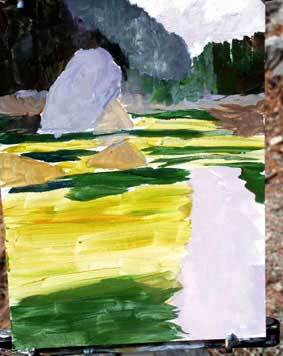 I am working more colors into the background such as Burnt Sienna in the stream bank. I work the entire painting again, giving everything another coat of color. I generally do at least three complete layers over every part of the painting before it is complete. Acrylics tend to be thinner than oil, and this multiple coating technique builds different colors over one another giving more depth and feeling to the painting. At this point, I start putting more detail in the distant trees. I also work the far stream bank a little more, adding more detail such as the rocks. I start adding reflections in the distant water. I start adding some Sienna to the water in the middle ground which are the rocks in the bottom of the river. 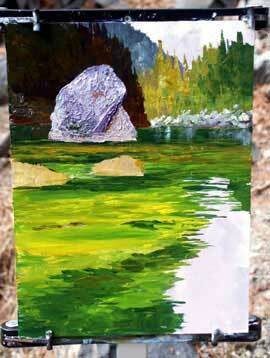 For the large rock I switch to a palette knife. The paint here is laid on fairly thick to form the consistency and sculpture of the rock. I use the premixed Gray and add Burnt Sienna, premixed Purple, a little Sienna and others to give the rock more texture and color. I now work further on the pool of water. 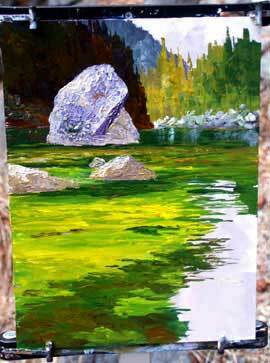 The green is quite brilliant, so I use primarily a mixture of Thalo Blue and Cadmium Yellow Medium. For the darks in the stream bottom, I add Burnt Sienna, and sometimes the purple which I mix from Ultramarine Blue and Quinacridone Red. 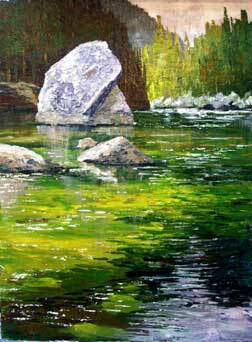 I continue working on the foreground pool and begin to sculpt in the smaller rocks with thick paint and a palette knife. I used the premixed gray along with Sienna for these rocks. I also begin to develop the reflections and patterns in the bottom of the pool. 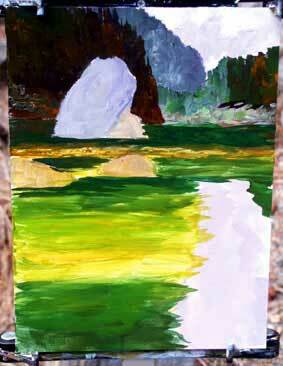 I continue to work on the pool, working the deep greens into the reflected light. I also start adding in the reflected light in the pool. I do this by dabbing a little light gray at the top of the reflection and then pull it down with my finger. I keep adding more reflection on the surface of the water. 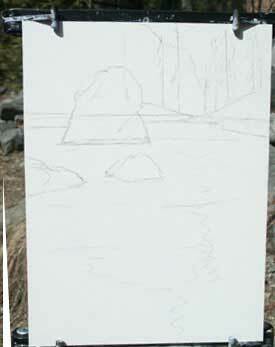 Since the under painting is dry, it is easy to drag down a wash of grayish white to indicate the reflections of the rocks. I also add some white sparkles around to give the effect of the glinting water. 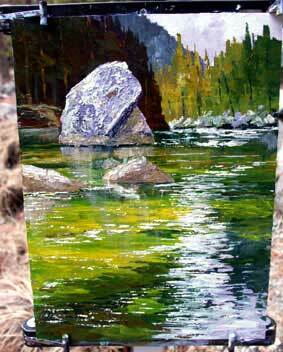 One of the advantages of acrylics over oils is glazing can be quickly done in the field. With oils, you would have to wait days for the painting to dry in order to accomplish the same effect. I spent just under two hours on the painting, and this is the way it looked as I was finishing it on the scene. Here is a photo of the scene when close to finished with the painting. I forgot to mention, it rained, sleeted and hailed while doing this study. You can read more about that day and painting on my weblog. Here is the final painting. After I got home, I realized the light reflection in the water detracted from the overall scene, so painted some of it out and grayed out the rest.